Ultrasonography has emerged as an increasingly valuable diagnostic tool to help with decision-making. Several recent ED studies have demonstrated that bedside ultrasonography significantly improves clinicians’ ability to differentiate between cellulitis and abscess and, thus, to initiate the most appropriate treatment from the outset. [3, 8] The advantages of bedside ultrasonography include low cost, portability, patient comfort, speed of detection (usually < 1 min), and wide availability. Additionally, if a fluid collection is detected, ultrasonography can better localize the fluid for subsequent aspiration or incision and drainage. 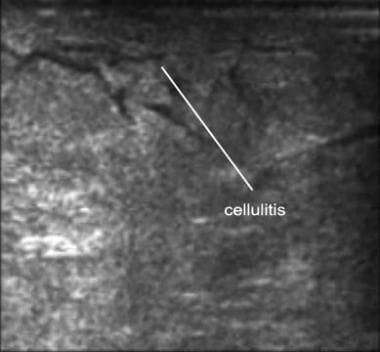 Patients who present with localized signs of swelling, pain, and erythema, and in whom cellulitis and abscess might be present, are excellent candidates for bedside ultrasonography. No contraindications exist to using bedside ultrasonography to differentiate between simple cellulitis and abscess. No anesthesia is required, although analgesia should be considered to increase patient comfort and ease of scanning. The patient should be positioned so that the full area of interest is exposed and readily accessible to the examiner. While dressings and clothing should be removed for complete visualization, optimal exposure must be balanced with appropriate draping of potentially sensitive areas. Set up needed equipment at the bedside. Start with the linear transducer set at a frequency between 5.0 and 7.5 MHz. If a deeper collection is suspected, consider switching to a curvilinear probe set at 3.5 MHz. Position the patient as described above and clear the area of examination. Place the probe at the border of the region of interest and begin scanning the length of the affected area. This should allow for transition from normal to affected tissue for comparison. Extend the area scanned to completely visualize the edges of the infection in one plane. Repeat the scan in an orthogonal plane to form a mental 3-dimensional image of the area of interest. Identify normal subcutaneous tissue, fascial planes, and muscle as landmarks for comparison. Also be sure to identify any adjacent structures of interest, such as blood vessels or peripheral nerves (which can have a honeycomb appearance, see below). 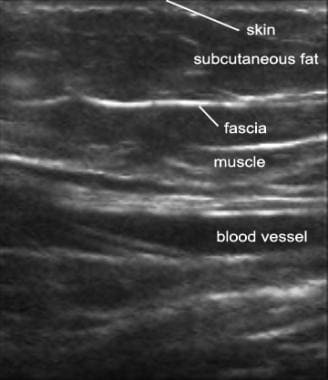 Ultrasound image of normal soft tissue. Continue scanning the region of interest to characterize the presence of fluid collection, the extent of collection, the depth of collection, echogenicity, and heterogeneity. Consider using a skin marker while scanning to mark sites for subsequent aspiration or incision and drainage. The video below depicts demonstration of ultrasonographic abscess evaluation. Demonstration and explanation of ultrasonographic abscess evaluation using a linear probe. Video courtesy of Meghan Kelly Herbst, MD. Also courtesy of Yale School of Medicine, Emergency Medicine. Normal subcutaneous tissue is hypoechoic with strands of hyperechoic connective tissue. Fascial planes are highly hyperechoic, and muscle tissue demonstrates a characteristic striated appearance. Vascular structures are anechoic and usually compressible with the transducer. Cellulitis results in hyperechoic subcutaneous fat lobules floating in edematous fluid. This is classically described as cobblestoning, and is shown below. Ultrasound image of cellulitis with cobblestoning. Cobblestone appearance. Video courtesy of Meghan Kelly Herbst, MD. Also courtesy of Yale School of Medicine, Emergency Medicine. 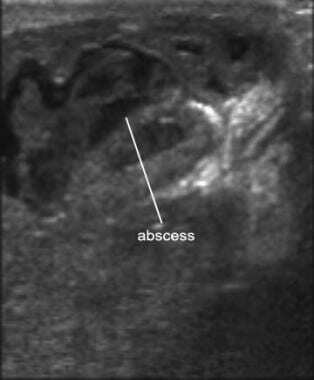 Abscesses have a wide range of sonographic appearances. Typically, they appear as anechoic or hypoechoic spherical collections of echogenic fluid with poorly defined borders. Additionally, septae, sediment, or even gas may be present within the fluid collection. Compression with the transducer may induce movement or swirling of the contained pus. See the images below. 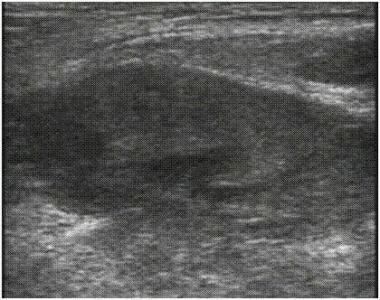 Ultrasound image of a typical spherical abscess. 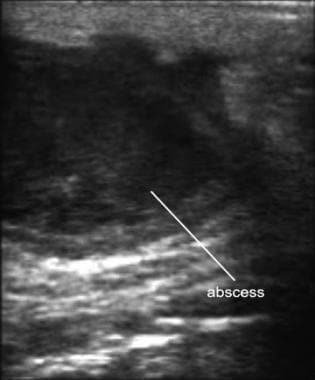 Ultrasound image of an abscess. Note the heterogenous appearance. Cine loop of an abscess. Video courtesy of Meghan Kelly Herbst, MD. Also courtesy of Yale School of Medicine, Emergency Medicine. If an abscess is identified, thorough characterization of its location, size, and extent helps dictate further management. A standoff pad may be useful to elevate the transducer, as this improves image resolution by moving the region of interest into the focal zone. This is particularly helpful when evaluating superficial structures such as the hands and feet. Commercial pads can be purchased and customized to a given situation. Alternatively, bags of saline, water-filled gloves, or water baths may be substituted. 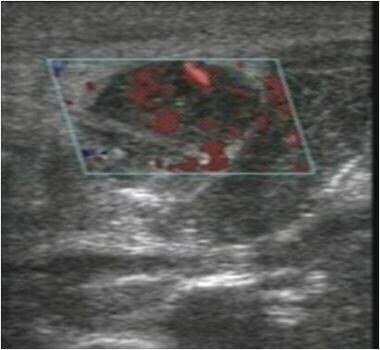 Color flow Doppler sonography, shown below, is useful in identifying adjacent vascular structures prior to performing any percutaneous interventions. This modality can also help identify lymph nodes, which can easily be mistaken for fluid collections. Lymph nodes are highly vascular and demonstrate strong color flow signals, while abscesses do not. In addition, compressing lymph nodes does not result in the typical swirling flow of fluid that is often seen with abscesses. 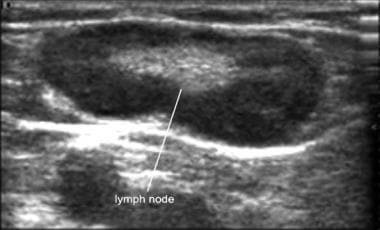 Ultrasound image of a lymph node with its characteristic hyperechoic center and hypoechoic rim. Ultrasound image of a blood vessel lying deep to a lymph node. 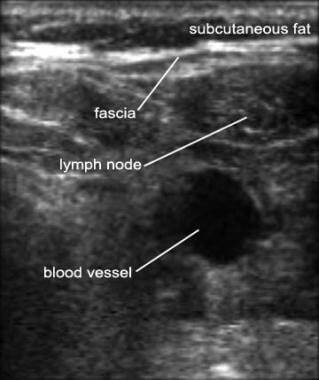 Ultrasound image of a lymph node demonstrating color Doppler flow. Computed tomography (CT) remains the criterion standard for abscess evaluation. CT may still be necessary if the ultrasound is indeterminate or unable to adequately delineate the full extent of the abscess. Herniated bowel, shown below, may be confused for an abscess but can be differentiated by the presence of peristalsis. Ultrasound image of herniated bowel. Scanning the contralateral side of the body for comparison is always helpful when trying to differentiate normal tissue from abnormal tissue. If complicated, percutaneous interventions should be ultrasound-guided to ensure proper positioning and complete drainage. The use of bedside ultrasonography in the evaluation of soft tissue infections presents no appreciable risks. Like any ultrasound study, be sure to consider the operator's skill and training. Some sonographers have had more experience than others in evaluating and assessing soft tissue infections. Abrahamian FM, Talan DA, Moran GJ. Management of skin and soft-tissue infections in the emergency department. Infect Dis Clin North Am. 2008 Mar. 22(1):89-116, vi. [Medline]. Tayal VS, Hasan N, Norton HJ, et al. The effect of soft-tissue ultrasound on the management of cellulitis in the emergency department. Acad Emerg Med. 2006 Apr. 13(4):384-8. [Medline]. Lewis DL, Butts CJ, Moreno-Walton L. Facing the danger zone: the use of ultrasound to distinguish cellulitis from abscess in facial infections. Case Rep Emerg Med. 2014. 2014:935283. [Medline]. Marin JR, Dean AJ, Bilker WB, Panebianco NL, Brown NJ, Alpern ER. Emergency ultrasound-assisted examination of skin and soft tissue infections in the pediatric emergency department. Acad Emerg Med. 2013 Jun. 20 (6):545-53. [Medline]. Rogers RL, Perkins J. Skin and soft tissue infections. Prim Care. 2006 Sep. 33(3):697-710. [Medline]. Squire BT, Fox JC, Anderson C. ABSCESS: applied bedside sonography for convenient evaluation of superficial soft tissue infections. Acad Emerg Med. 2005 Jul. 12(7):601-6. [Medline]. Cohen PR. Community-acquired methicillin-resistant Staphylococcus aureus skin infections: implications for patients and practitioners. Am J Clin Dermatol. 2007. 8(5):259-70. [Medline]. Cohen PR. Community-acquired methicillin-resistant Staphylococcus aureus skin infections: a review of epidemiology, clinical features, management, and prevention. Int J Dermatol. 2007 Jan. 46(1):1-11. [Medline]. Cosby KS, Kendall JL. Practical Guide to Emergency Ultrasound. 1st. Philadelphia, Pa: Lippincott Williams & Wilkins; 2006.